We don’t learn anything new about Neil Armstrong, Buzz Aldrin and Michael Collins, but Apollo 11 has dependably stunning never-before-seen footage from the NASA vault. Less talk, more pertinent shots of men in action and mesmerizing shots of crowds of tailgaters outside the Kennedy Space Center. This documentary gives much physical life to July 1969, without commenting on it. There are no retrospective interviews or narration, just a meticulous stitch of one after another procedural events as if it is happening in the presence tense. 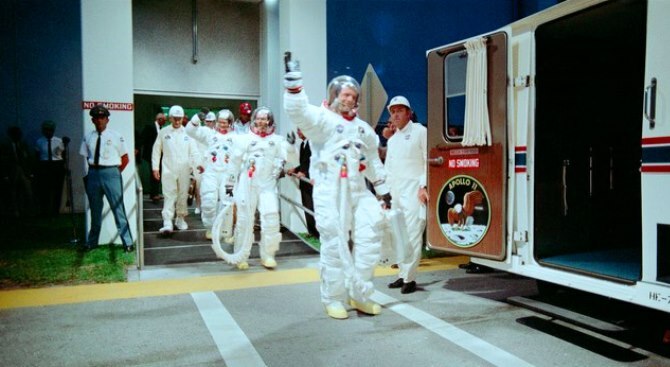 Everything about “Apollo 11,” directed and edited by Todd Douglas, is much better in editing terms and visual splendor than “For All Mankind,” that 1989 entry that was the first documentary to get out there but was much too raw, scratchy and unshaped. Though it is not as good as “In the Shadow of the Moon,” the 2007 documentary which had talking heads but was erudite in a welcoming way (Michael Collins was the most fascinating speaker). Some of this “Apollo 11” doc felt like a rerun, but anything that is about outer space has to be a worthwhile revisit of time. What is definitely the exception is the emphasis that an orbit and slingshot effect was needed to get the rocket from Earth to the Moon. If “Apollo 11” is your first documentary on the space race, then be sure to track down “In the Shadow of the Moon” to watch next. If you saw “First Man” and wanted more little details filled in, then check out at least one documentary to go with the experience. When Ryan Gosling played Neil Armstrong, he got the inward and furtive nature of the man right, but he forgot the adventurous mirth of the man. Enough in “Apollo 11” reveals that. I do wish though Douglas had found more footage of the astronauts inside the lunar module. Film Cousins: “The Right Stuff” (1983); “For All Mankind” (1989); “In the Shadow of the Moon” (2007); “First Man” (2018).